The Altograph of Washington City, 1892. American cities in the 19th century were walking cities—most residents worked and shopped close to where they lived. But as electric streetcar (trolley) systems were built in the 1880s, 1890s, and early 1900s, cities expanded. Many white city dwellers moved to new trolley suburbs; streetcars made it easy to travel greater distances to work, shop, and socialize in town. City streets and the patterns of people’s daily lives changed. In Washington, streetcars turned outlying areas into new neighborhoods. Real estate developers often built streetcar lines to promote new suburban communities. Their success in selling the suburbs to middle-class workers changed neighborhood life and the rhythms of the city. The trolley also connected Washingtonians to the city’s largest public market. There, shoppers could find produce and meat from regional farms, fruits and vegetables from across the country, as well as a few products—such as bananas—from overseas. Like many big cities, Washington, D.C., had several large markets where residents shopped daily for foodstuffs. Center Market, Washington’s largest, was built in 1871. Located at 7th Street and Pennsylvania Avenue, N.W., (where the National Archives stands today), the market covered two city blocks in the heart of Washington’s business district. The approximately 700 dealers who rented space on the ground floor of the Center Market sold both local produce and foods from around the region, the nation, and the world. With the growth of railroads and commercial farming, more and more people were able to buy oranges, bananas, and other fruits and vegetables that were previously unavailable or too expensive. Center Market opened early in the morning and usually closed by mid-afternoon, except on Saturday, when it was open all day. Different classes of people visited the market from all parts of the city. The best (and most expensive) produce and meats sold early. As the day went on, prices and quality lessened. Although Center Market was built in 1871, the square operated as a marketplace from 1801 until 1931, when the National Archives building was erected in its place. Farmers from outlying parts of the District and from nearby Maryland and Virginia rented Center Market’s cheaper outside stalls and sold their produce to city residents. The national rail system enabled businessmen to devise new distribution systems. Meat came from the stockyards (by refrigerated railroad car) to regional distributors for delivery to local butchers. Growers sent fruits and vegetables to wholesalers for resale to retailers. National brands came into being to take advantage of national advertising and distribution networks. About 300 local farmers rented stalls outside Washington’s Center Market. 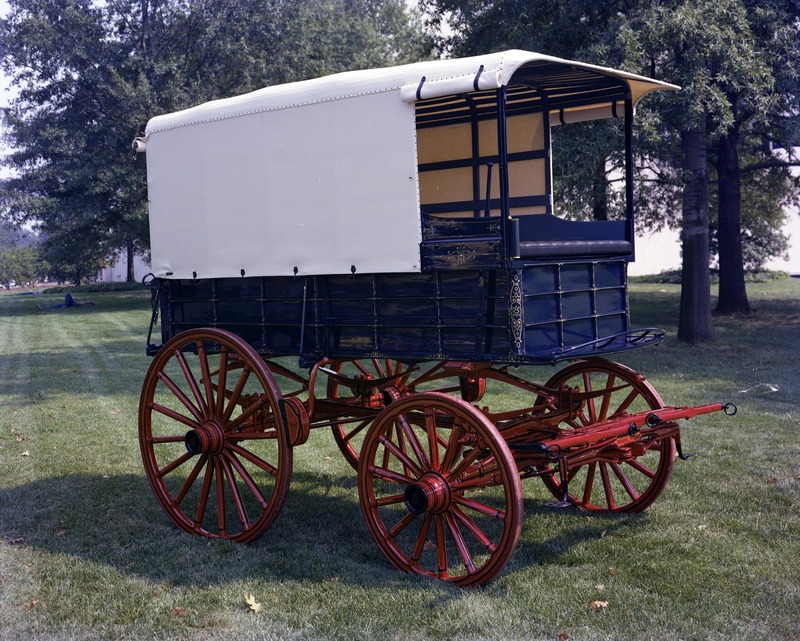 Even after improvements in regional and national transportation systems, farmers who drove their wagons into the city to sell their produce remained a critical part of the District’s economy. Courtesy of Historical Society of Washington, D. C.
Farmers from the District and Maryland took this road to reach Center Market. Once they reached the city, local farmers could set up for free at the sidewalk market across from Center Market. Many city businesses made use of delivery wagons like this one, which was built in Maryland. In 1900, over three million horses worked in American cities. They produced some 30,000 tons of manure every day. This was a major urban concern, used by promoters of motorized vehicles to sell the idea of trucks and automobiles to the public. Pedestrians, carriages, farmers’ wagons, express wagons, delivery wagons, bicyclists, streetcars, and even the occasional automobile shared Washington’s streets in 1900. Washington had always been known for its wide streets, and beginning in the 1870s the District government invested in better street surfaces. In the downtown area, gravel was eventually replaced with stone blocks or asphalt. Washington’s broad streets allowed the addition of electric streetcars more easily than did the narrower streets of many cities. Street vendors sold foods and services to residents. This practice sometimes put vendors at odds with neighborhood shopkeepers. In Washington, as in most cities in 1900, people usually walked or took public transportation. Some used bicycles. Wealthier residents owned their own carriages and usually stored carriages and stabled horses at commercial liveries. Improved streets allowed more traffic, but vehicles were still slow enough that pedestrians could walk in and cross the street at any point. Over the next 20 years this would change, as growing numbers of autos took over city streets. The 1890s saw a great boom in bicycling. 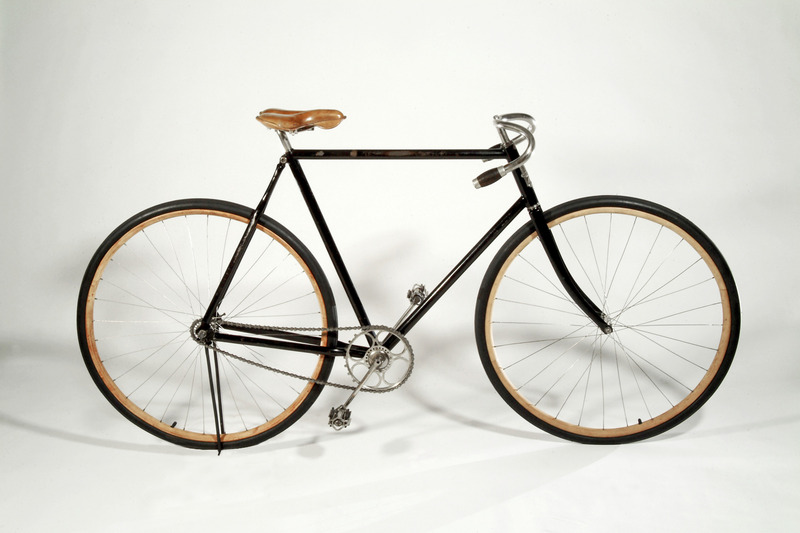 As the first personal mechanical mode of transportation, the bicycle often gave both men and women a thrilling sense of freedom. Cycling quickly became a popular way to get around the city, and on weekends many bike enthusiasts went for rides in the country. 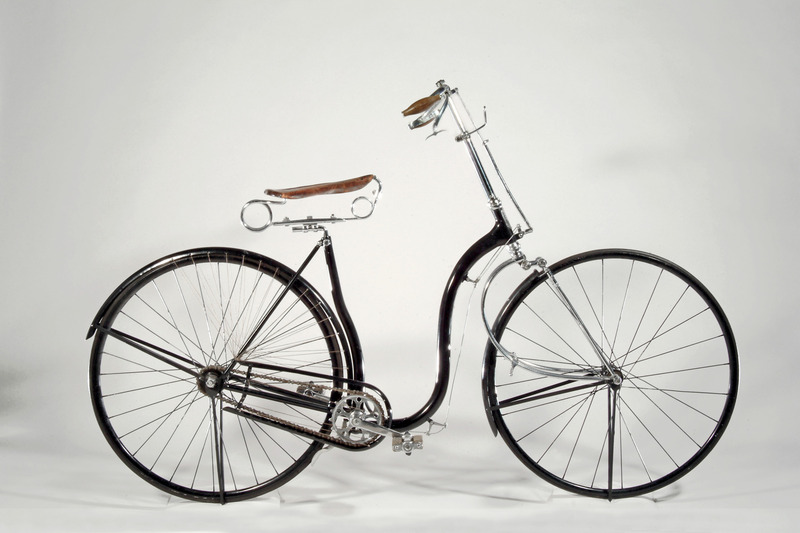 In the 1890s, bicyclists played a major role in lobbying for road improvements. Horse-drawn carriages were common on Washington streets in 1900. By the time this photo was taken in the 1920s, automobiles had changed the city streetscape, and the carriage was becoming a rarity. 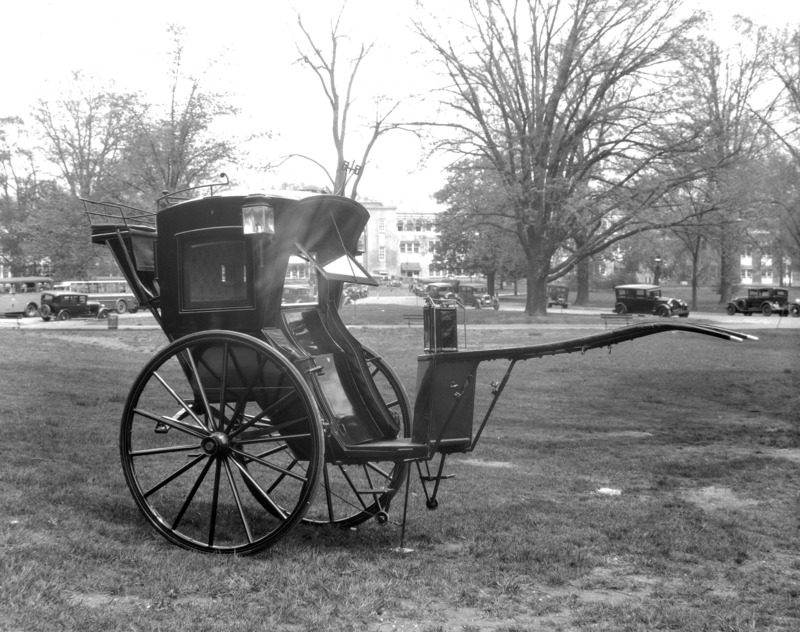 Hansom cab, about 1900 Gift of Alice Maury Parmelee Most hansom cabs were public vehicles, available for hire, but this one was owned by a Washington, D.C., family. They used it into the 1920s. Around 1900, trucks and automobiles began to appear on city streets. Only the wealthy owned cars, which were used mostly for recreation and short trips. Washington, one of many American cities that built new electric streetcar systems, began converting from horse and cable cars in 1888. Trolley lines created the modern suburb and the commuter and enabled people to live farther from their jobs in the commercial center of the city. In Washington, the streetcars were privately owned and run. Real estate developers built many lines to promote new neighborhoods. Washington’s streetcar companies consolidated into two systems in 1902. Washington’s first electric streetcar line was the Eckington & Old Soldiers’ Home Railway, chartered in 1888. In this photograph documenting its first day, people are gathered on New York Avenue, near the end of the line at Mount Vernon Square. In Washington, two men operated a streetcar. In 1900, the nation’s streetcar men worked an average of 12 ½ hours a day. Subtext “Jim Crow” Public transit was a battlefield in race relations, especially in southern cities where “Jim Crow” laws restricted African Americans’ access to public transportation. In 1896, Homer Plessy sued to overturn a law that barred him from riding in a “whites only” railroad car. The Supreme Court upheld Louisiana’s “separate but equal” accommodations, and other southern cities passed laws segregating transportation systems. While the District did not pass a streetcar Jim Crow law, unwritten social customs segregated blacks and whites on the streetcars and in other public places. 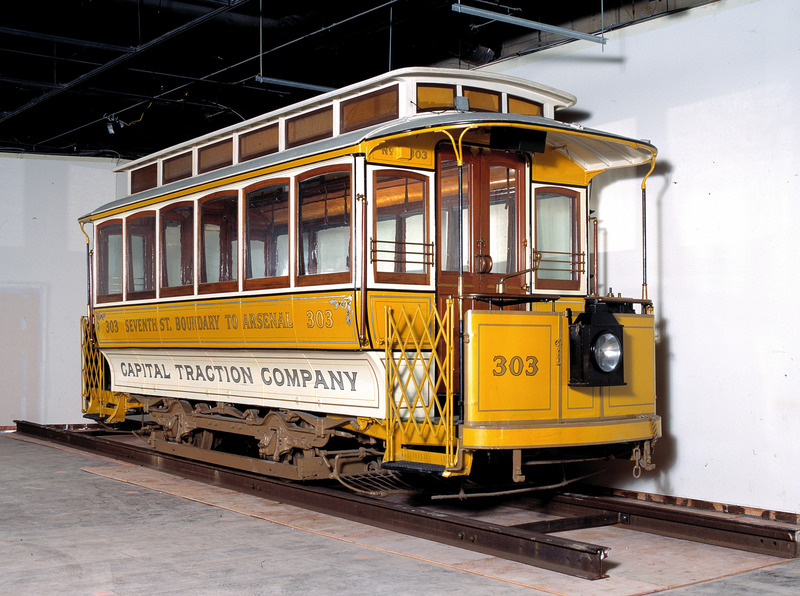 This Capital Traction Company streetcar ran along 7th Street from the wharves at the Potomac River to Boundary Street (now known as Florida Avenue), which at the time was the edge of the City of Washington. Washington banned overhead wires, so streetcars used an underground electrical conduit within the city and an aboveground wire outside city limits. In the 19th century, some Americans began to live in a new kind of community, suburbs, where they enjoyed pastoral surroundings but could commute to the city for jobs and shopping. Suburbs were made possible by railroads, horsecars, cable cars, and electric streetcars. Some suburbanites left the city to get away from poor immigrants and migrants. Others believed that a quiet, less-congested area was better for health and family. In 19th century cities, people of different races and incomes lived in close proximity. With the rise of suburbs, communities became more sharply divided by race, wealth, and ethnicity. Subtext Early Washington Suburbs Suburban development began slowly in the 1850s around the City of Washington. Land speculators established suburban sites like Uniontown (later known as Anacostia), Mount Pleasant, Le Droit Park, and Takoma Park near roads, street rail lines, and railroads that led into the city. Uniontown was laid out across the Anacostia River from Washington in 1854. The developer hoped to attract Navy Yard employees who could walk across this bridge to work. In 1873, speculators turned farmland into Le Droit Park, an exclusive, fenced-in subdivision located near a horse-drawn streetcar line that carried residents downtown. Courtesy of Historic Takoma, Inc. In 1883, Takoma Park, a “railroad suburb,” attracted government workers. Sales literature advertised that living expenses would be relatively cheap compared to the city. Moving to the suburbs changed people’s lifestyles. Homeowners now had the responsibility of maintaining the home and a yard. And women were more isolated from the once easy walk to the market, shops, and friends. Electric Streetcar Suburb: Chevy Chase, 1890s Sensing profit in the public’s need for transit and housing, businessmen established streetcar lines to open up new areas for development. The Chevy Chase Land Company developed more than 1,700 acres that straddled the Maryland-District line. The Rock Creek Railway connected Chevy Chase to the city. Chevy Chase grew slowly until World War I, when the automobile made suburban living more and more convenient. Trolley passing a real-estate billboard on a developing section of Connecticut Avenue, about 1903. To get potential buyers to Chevy Chase, the development company extended Connecticut Avenue and built bridges, an electric streetcar line, and an amusement park. In 1900, a streetcar ride from Chevy Chase to downtown Washington took 35 minutes. Houses on Valley Street, Anacostia, about 1885. Charles A. Cugle house, Chevy Chase, built about 1900. Photograph by Theodor Horydczak, courtesy of Library of Congress, Prints and Photographs Division. In the early 1900s, streetcars and electric interurban systems helped fill the nation's transportation needs. By 1917, there were 45,000 miles of transit track in the country, and millions of streetcar riders. But over the next few decades, the limitations of streetcar systems, government and corporate policies and actions, consumer choice, and the development of alternatives—especially the bus and the car—helped make trolleys obsolete. Buses started to replace trolleys in the 1910s. Many commuters considered buses a modern, comfortable, even luxurious replacement for rickety, uncomfortable trolleys. Buses made business sense for transit companies; they were more flexible and cheaper to run than streetcars. In a few cities, auto and auto-supply companies, including General Motors, Firestone Tire and Rubber Company, and Standard Oil of California, bought an interest in transit companies and encouraged the conversion from streetcar to bus. But many cities made the choice to switch without this influence, and by 1937, 50 percent of the U.S. cities that had public transit were served by buses alone. Most importantly, Americans chose another alternative—the automobile. Cars became the commuter option of choice for the growing number of people who could them. In Washington, D.C., the last streetcar ran in 1962. In 2002, the city’s public-transit authority runs an expansive bus service and a subway system. But as in most cities, the majority of D.C.-area residents prefer to drive alone in their cars from their homes to their workplaces.